"Very good course. Look forward to the next one"
Understanding electricity, Workshop safety procedures, Staff safety, Avoiding computer damage, Circuits, Measuring electricity -current, voltage, resistance, ohm's law, etc. Different Systems & Basic Disassembly. 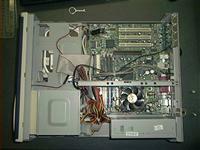 Identifying and removing specific parts from a computer, distinguishing between different types of PC (eg. XT, AT, 386, 486, Pentium etc), disassembly procedure. Preventative and routine maintenance procedures. Determining an error, hard disk problems, viruses, motherboard battery, bugs, other common errors and their remedies, when to call a specialist. How Do you Sort Out Computer Problems then? There are many different devices that can be used to test the functionality of various PC components, ranging from multipurpose devices such as Multimeters and Oscilloscopes to specific tools such as Network Protocol Analysers. Usually the more specific the task of the tool, the less likely it is to be of use, and the more expensive it is. A good knowledge of what tools are available and how they are used can mean the difference between putting yourself in a life threatening situation, or wasting thousands of dollars and performing the role of a computer technician safely and efficiently. Many modern devices use digital means to provide a continuous or “analogue” readout, as compared to an “on – off” or “digital” meter, so these terms are somewhat blurred in today’s language. When discussing an Analogue Meter we are referring to a continuous read out or display, and a Digital Meter has a stepped display limited to certain increments. Faults with hardware devices are actually very rare, unless the part is old and nearing the end of its designed functional life span, due to the stringent quality control measures from the manufacturer. Generally the root cause of hardware faults will be caused by a software issue, such as a corrupted or incorrect driver. A good piece of advice for troubleshooting a PC, is that it is essential to have a planned line of attack. Ie understand what the fault is and areas within the machine potentially responsible for the fault. Once the fault type is understood, determine a procedure / process for testing each of the potential fault area individually. That way the troubleshooting process will be far more effective and resultantly you’ll be more likely to pin point the actual root cause of the problem rather than unnecessarily, through trial and error, replacing the wrong hardware / software (or maybe both) in order to get to the root cause. This planning will not only save time and money but will greatly develop your troubleshooting skills. Going at it like a bull in a china shop will almost always make it worst. There is lot of software for diagnosing various software related problems. There are lot of websites on the internet which actually run a diagnostic check on your computer to see if there are any problems. Learn more by enrolling on the course. Learn how to market your business online using sites such as facebook, twitter, LinkedIn, pinterest and wordpress. This book offers a great overview of marketing techniques, both past and present. It is a wonderful introduction to the world of e-commerce, providing useful background information and insights into modern marketing styles.